Are Broken Windows Worth Our Tears? Over the last four months, Doug Ford and the Conservative Government of Ontario have wrought a lightning swift assault on the poor and marginalized in Ontario—taking away every available scrap and aid that the state has provided since the last period of Conservative rule in the province under Mike Harris and his immediate successors. This attack on the liberal social safety net has been mourned by the Labour Movement, and yet when everyday people organize and express their rage, what is Labour to do but side with their erstwhile enemies-in-power? 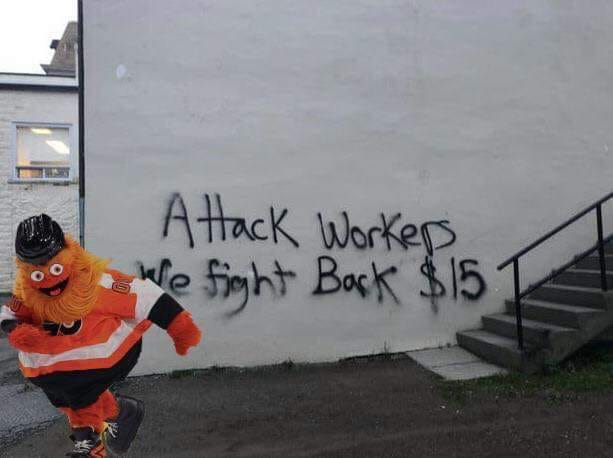 The most recent attack by the Ford Government against the slow gains of the progressive Left has been long awaited: The rollback of recently increased worker protections (such as limited paid sick days) and a minimum wage increase to fifteen dollars an hour. As the CBC reports, these various protections and increase will be replaced with a total rollback of protections and a minimum wage freeze until 2020. This is additionally being coupled with a directive from the Ministry of Labour, as the Toronto Star notes, “not to initiate any new proactive inspections aimed at preventing wage theft and other employment standards violations”. The wide violation of labour protections that have been offered up by the State is only one sector of a series of attacks on progressive programs by the Ontario Conservatives ranging from the basic income pilot to free expression of dissent on university and college campuses and a whole lot more. These violations have provoked some response from the officialized Labour movement and members have join rallies around the province to speak on these matters. Yet, no response from the official outfits of the OFL were as pointed or strong as the direct attack upon the local offices of the Labour Minister Laurie Scott after the passage of their rollback law.In turn, Chris Buckley of the Federation weakly condemned these acts of outraged workers saying, “I want to be clear, the Ontario Federation of Labour (OFL) does not support or condone violence against persons or property in any form”. For anyone versed in the politics of the social democratic cabal that runs the OFL, one would not be terribly shocked by this response. From the consistent condemnations of the black bloc tactics by Ontario labour leaders to Andrea Horwath's hyper-defense of gentifiers in Hamilton, social democrats stick to a wide tradition of condemning acts of political tactics outside their narrow definitions of dissent. Certainly, these folks raise their voices to howl when legislation is undermined, but when it comes to concrete action, they do little to further movements.Again, this is nothing new. Countless activists who were involved during the Days of Action in the 1990s against the then-Harris government describe an initial upsurge in officialized Labour movement activism, but a slow tapering off of involvement and a stymying of momentum. And we can see this reflected now in many of the component of the OFL today. Smokey Robinson, of the Ontario Public Service Employees Union (OPSEU), said the following while his membership proclaimed ‘war’ against the Conservatives:I told Doug Ford we wanted to help. I said OPSEU frontline workers had thoughtful suggestions for the government. Premier, let’s talk. Let’s work together to solve the province’s fiscal problems. Because we won’t let you put the boots to our members and public services. And we won’t back down. We never have. We never will. Not on my watch.Help. Suggestions. This is the real state of officialized Labour, whether or not various bodies will admit the truth of it. Robinson is just simply honest about the role that officialized Labour wishes to play in this new normal: They want to help the repressive state, even if they’ll get a little mad.So, the officials of the Labour movement are more focused on helping while getting in the PR spotlight—meanwhile, our rage is to be redirected, calmed while those who take up actions outside the official spectrum of allowed tactics are to be condemned. This isn’t to say, mind you, that we cannot debate the timeliness or tactics of a given action, but this reaction from officialized Labour is not a genuine contribution to such discussions but a cotowing to Capital and the State. As Dr. Jonathan Cutler noted to NPR in 2006 regarding the Haymarket Riots:In the time of the Haymarket affair, anti-immigrant nationalists sowed the seeds of chauvinism through labor market exclusion; shorter-hours activists sustained a vision of solidarity without borders. Where employers expected docile immigrant bodies, immigrant activists responded with May Day militancy.And this is the wider context that recurs today. Many of the supporters of the Ford Government in Ontario are as anti-labour and anti-migrant as one will find elsewhere in this world afflicted with the rise of the far right from Trump to Bolsonaro. That Ford is often compared to these figures is no surprise, nor are his associations with third-place mayoral candidate and white supremacist Faith Goldy. In the past, such arising forces would be met with militancy.If the OFL and other forces of official labour cry out now for broken windows and ‘violence against property’ when we fight for the barest scraps of justice, what use can we expect them to be when the chips are actually down for those impacted by these wider violences brought about by the State and its supporters?As Cutler says of the American labour movement, so I would here: Today, labor has formal rights but no soul. Syndicalists have long drawn themselves deeper into the legalistic mechanisms of the State and social democracy, but have no desire to fight back. Instead, they cry for windows in Kawartha and Hamilton, rather than for those impacted by capitalist exploitation and state violence.This lack of fight extends to vision too—as social democrats in so-called Canada simply seem to have none.¹ So then, if we can’t expect the social democrats and official Labour to help, what are those involved in unions to do? Perhaps it is time to form labour caucuses and fighting formations outside trade union bodies? The model of the IWW’s General Defence Committee could well be one avenue in its firm commitment to anti-fascism and labour action, but that alone cannot be enough. While we need common fronts of the Left to carry out actions, tying our fates to moribund and fearful official Labour seems like a death-sentence for organizing in any way. [talk about threat of fash] I would hope that we all can build our local capacity, with our comrades and co-conspirators, but without elevating form or a given tactic over function. And even if an action takes place that we don’t like, may we never be as cowardly and craven as Chris Buckley.In these times, we cannot hold back our rage, we cannot police each other in our movements, we cannot wait. We can build together now, but to do so we have to stop crying over broken glass and start laying foundations of a new alternative to the rise of the far right.O. Berkman is an indigenous anarchist writer on topics of history and currently anti-fascism located in territories of the Algonquin (so-called Central Ontario, Canada). Currently, O.B. dual-cards with the IWW and the Canadian Union of Public Employees, putting their words where their mouth is with the Cops Out of CUPE campaign. They write about other stuff too, but we’ll include that here as we go.¹ Some will rely on Quebec as an exception to this notion. However, Quebec Solidaré neither unconditionally stands with movements or had enough vision to actually defeat the rise of the Right.